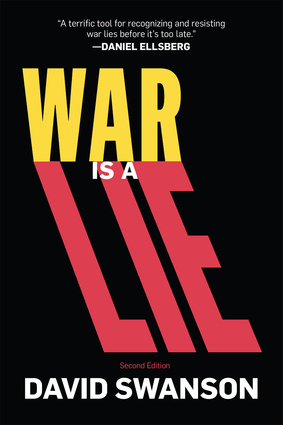 War Is A Lie is a thorough refutation of every major argument used to justify wars, drawing on evidence from numerous past wars, with a focus on those that have been most widely defended as just and good. This is a handbook of sorts, an engaging, always informative manual that can be used to debunk future lies before the wars they're deployed to justify have any chance to begin. Veteran antiwar activist Daniel Ellsberg calls War Is A Lie "a terrific tool for recognizing and resisting war lies before it's too late." This updated and expanded edition outlines lessons from America's most recent wars, what can be done to end warmaking, and an epilogue that analyzes new trends in war lying and in resistance to it. No one to whom you give this book can claim they haven't been warned! "David Swanson's War Is A Lie should be required reading. It… gives you the arguments, outrage and inspiration you need to take action. Read it. "—Medea Benjamin, author, peace activist. "This updated version of David Swanson's classic, War Is A Lie, dispels any notion that the Obama administration has been more truthful or law-abiding than Bush and Co. On the most critical issue of our time, 'hope and change' have meant only more sophisticated lies, secrets and war propaganda, not a new commitment to peace." —Nicolas J. S. Davies, author of Blood on Our Hands: The American Invasion and Destruction of Iraq. "You don't have to be an absolute pacifist… to find this book a terrific tool for recognizing and resisting war lies before it's too late." —Daniel Ellsberg. "The world needs more true advocates of democracy like David Swanson!" — Thom Hartmann, author, radio host. "David Swanson predicates his belief that nonviolence can change the world on careful research and historical analysis." —Kathy Kelly, author, peace activist. David Swanson is an author, activist, journalist, public speaker, and radio host. His books include When the World Outlawed War, and War No More: The Case for Abolition. Swanson serves as director of World Beyond War, and host of Talk Nation Radio. He blogs at DavidSwanson.org and WarIsACrime.org. In the early 2000's, he helped to expose the "Downing Street Minutes" and other attempts to lie the United States and its allies into the Iraq war. In 2015, he was nominated for a Nobel Peace Prize.